1/2" groove by 8 " OD. Truly a heavy duty pulley. Observe the size of the double row, double sealed ball bearing. 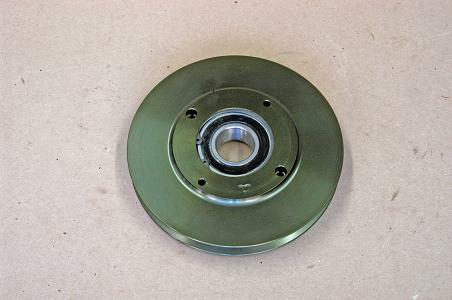 This is the pulley we make for our 1/2" Diamond Sheave. We turn the pulleys out of 6061T6 aluminum bar stock sawed billets. The High Speed bearings are a light press fit , also retained by snap rings.